London, 29 November 2016: Visa (NYSE: V) today announced shoppers in the UK spent more than £2Bn on Visa cards on the day that has come to signify the kick-off of the Christmas retail season, with nearly half of that spend occurring online. Whether online or in-store, buying gifts or enjoying Christmas revelry, shoppers are foregoing cash, opting for the speed and convenience of contactless cards and new payment methods. Contactless uptake across Europe has grown from 36% in 2015 to 52% in 2016, according to Visa’s 2016 Digital Payments Study. This trend is not solely reserved for younger, more tech-savvy consumers. Contactless uptake has increased across all age demographics, the greatest increase within the 55-64 age bracket, which has witnessed 64% growth since 2015. Moreover, the adoption of contactless cards is having a tangible impact on other payment methods. Europe-wide, contactless card users are more open to using a mobile device as a payment method in a shop (52% contactless card user vs 32% non-contactless card user), to shop via a retailer app (49% vs 31%) and to pay for a meal (50% vs 30%). As well as reaping the benefits of contactless payments, consumers are also recognising the benefits of other new payment methods. In 2016, 44% of the people Visa surveyed across Europe reported using mobile payment apps, up from 38% last year. Nearly half (46%) agree that having the option of paying using their mobile or wearable device has made it easier to buy the items they need. This added convenience is also fuelling an uptake in digital wallet usage across a variety of purchasing channels. European consumers are interested in using digital wallets to make purchases face-to-face (37%), through apps (51%), as well as online (56%). Consumers agreed that greater convenience (61%) and the ability to pay anytime, anywhere (59%), were the primary benefits. Visa’s Digital Payments study also revealed that shoppers are using a combination of online and physical channels when making purchases, particularly for more expensive items. Seven in ten European consumers are “showroomers” who view an item in-store before purchasing online, while nearly as many, 66%, “webroom”, meaning they look for the best price online, before purchasing the item in that retailer’s shop. Despite the rise on online Christmas sales, bricks and mortar continue to be an integral part of shoppers’ behaviour. 60% of consumers still enjoy the experience of interacting with staff and seeing the potential gift in person. “With more than £2bn being spent on Visa cards in the UK on Black Friday, we continue to see an increase in the shift from cash to cards when people do their Christmas shopping. This is driven by British consumers’ increased familiarity with contactless cards and other new digital payment services. “Consumers are now armed with a variety of new ways to pay - such as wearables and a range of digital wallet options on their mobile devices. These options provide consumers shopping in store with a number of fast, easy and secure ways to buy. 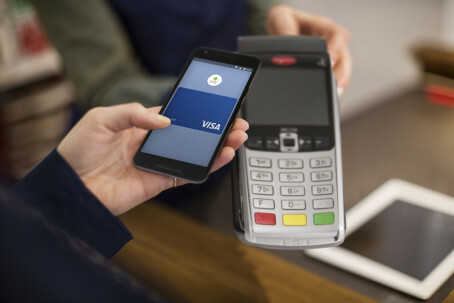 Visa Inc. (NYSE:V) is a global payments technology company that connects consumers, businesses, financial institutions, and governments in more than 200 countries and territories to fast, secure and reliable electronic payments. We operate one of the world's most advanced processing networks — VisaNet — that is capable of handling more than 65,000 transaction messages a second, with fraud protection for consumers and assured payment for merchants. Visa is not a bank and does not issue cards, extend credit or set rates and fees for consumers. Visa's innovations, however, enable its financial institution customers to offer consumers more choices: pay now with debit, pay ahead with prepaid or pay later with credit products. For more information, visit our website (www.visaeurope.com), the Visa Vision blog (vision.visaeurope.com), and@VisaEuropeNews.